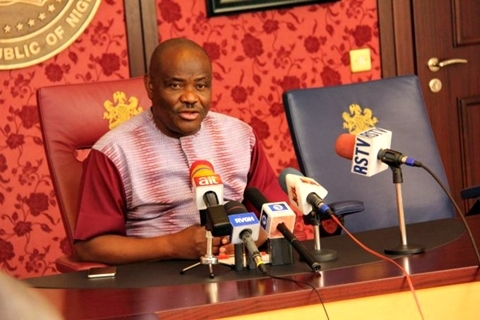 While speaking in an interview with The Osasu Show at the Government House Port Harcourt on Thursday, Rivers State Governor, Nyesom Ezenwo Wike, declared that he will not be vying for the Vice Presidential seat as being speculated ahead of the 2019 elections. According to Vanguard, the influential politician said though some of the Presidential Aspirants seeking his support have offered him the position of Vice President in the course of political consultations, he insisted that the interest of Rivers State is paramount. Wike said: “There are aspirants who have promised me the position of the Vice President, but I said I will not seek the position. “These are mere allegations. People can carry rumours, but everything I will do, will be in the interest of Rivers State. Nobody can use Rivers State as a tool. They did that in the past, but not anymore“. When asked to comment on the Lagos State political rift between Governor Akinwunmi Ambode and his godfather, Bola Tinubu, Governor Wike advised him to resist the godfather. He said that in Rivers State, the immediate past Governor sold State Assets to his business partner, only to turn around to annoint the business partner to contest for the governorship position of the state.